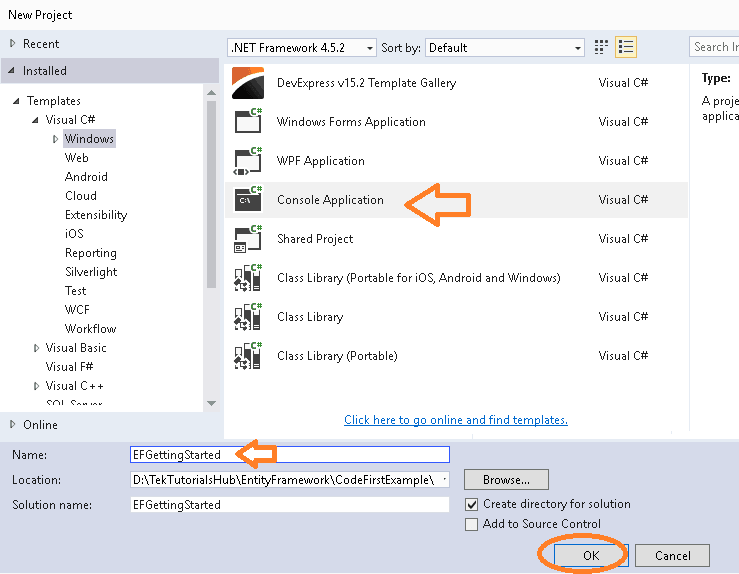 In this tutorial let us create a simple Entity Framework Code First Example application. We learn what is Entity Framework in the previous tutorial. In this article, we will show how to build a simple code first console application. We will show you how to create a simple entity. We will also show you how to perform simple CRUD operations on that entity and persist the entity to the database. In the Code First approach, you manually create the entity domain model (EDM) classes in your application. The database is created from these classes. This gives you the direct control of what is being generated in the database. The Visual model designer is not used in the code first approach. Code First follows the Domain-Driven Design (DDD) principles. In this tutorial, we will create a simple application with a user class. Our user class will have basic information like name and email address of the user. 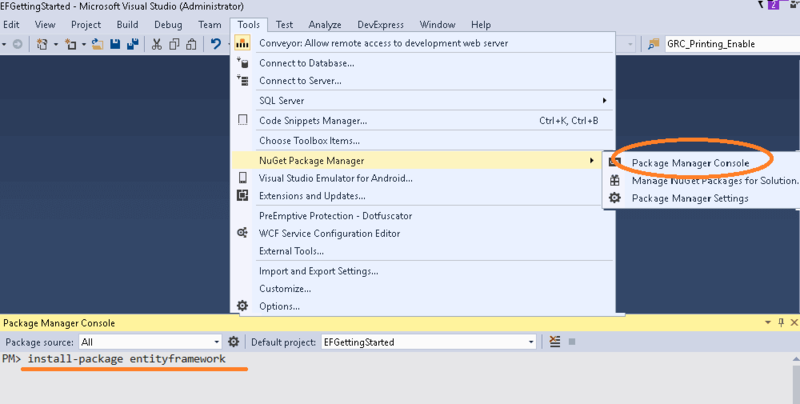 This will install the latest version of the Entity Framework (6.2.0). We are done with our entity model. The DbContext (often referred to as context) is the class which is responsible for interacting with the entity model and the data store. It allows you to query, insert, update and delete operations on the entities. This class is derived from the system.data.entity.dbcontext namespace. The older version of the entity framework used objectContext. DbContext is actually a wrapper around the objectContext class. The DBContext is the heart of the Entity Framework. It has several responsibilities. It Manages the database, Manages database connections, creates & initializes the database. It queries for data and converts them models by using the process called materialization. It keeps track of the added, modified & deleted entities in the memory and updates the database when asked for. In the above code, we created a new user instance. Then, we created an instance of the DbContext object. The DbContext returns the Users Entity set (DbSet<TEntity>). We invoked the add method of the Users object and passed the newly created user instance. Finally, we invoked the SaveChanges method of the DbContext object to save the changes to the database. Now we are ready to test our application. Open the Main method of the program class and add the following code. Run the Application. If everything is ok then you should see “press any key to close” message. Press any key and console window will close. We have not defined our database connection string. The EF is smart enough to discover and create the database for us. The EF uses a series of steps to discover and initialize the database. The Process is also called as database initialization. In the absence of any Connection String provided in the app.config file, the EF creates the database either in localdb or SQL Express depending on the system. In Visual Studio go to View->SQL Server Object Explorer option. 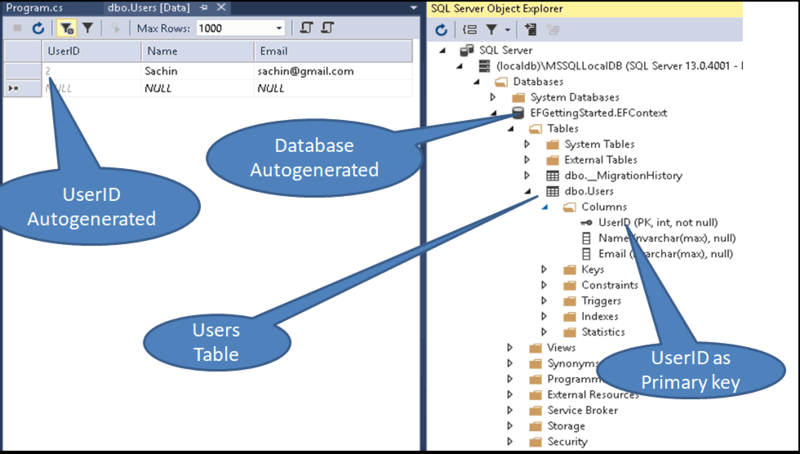 Under SQL Server, you should be able to see either (localdb)\V11.0 or (localdb)\MSSQLLocalDB. Expand the nodes and you will see that the database by the name “EFGettingStarted.EFContext” is created. Column UserID is automatically configured as Primary Key. The Code First does this by using Code-first conventions. It uses the model to create the database and build the tables and columns of the tables. The next option is to query the data. The querying is done by the find method, which takes the Primary key(s) as the argument and retrieves the matching row from the database and populates the entity. In this tutorial, we have created a simple code first example application to demonstrate the CRUD operation on users entity. We learned how to create a model. learnt how to create the Dbcontext class and create DBSet property of the model. Finally, we implemented a simple CRUD operations using console application. please keep generate this type of quality content.than you. When I paste the code into my Program.cs file, I get an error in my ctx.Users.Add(usr); line. The error is under the Users and it says EFContext.Users is inaccessible due to its protection level. I’m not sure what is going on because everything in my Model.cs is public like in the example. Is your DbSet in EFContext.cs also public as well? I only ask because I was getting the same error, and that turned out to be my problem.